Chitosan Based Biomaterials: Fundamentals, Volume 1, provides the latest information on chitosan, a natural polymer derived from the marine material chitin. Chitosan displays unique properties, most notably biocompatibility and biodegradability. It can also be easily tuned to modify its structure or properties, making chitosan an excellent candidate as a biomaterial. Consequently, chitosan is being developed for many biomedical functions, ranging from tissue engineering and implant coatings to drug and gene delivery. 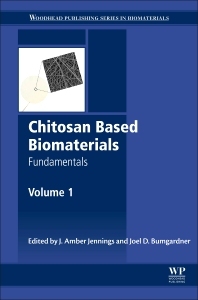 This book looks at the fundamentals of chitosan-based biomaterials. Dr. Jessica Amber Jennings is a biomedical engineering researcher with expertise in wound healing, infection prevention, drug delivery, biomaterials, and biocompatibility. Her research has explored the effects of electric fields, biomaterials, and growth factors on cells during tissue healing and regeneration. Further, she has designed biomaterials to inhibit attachment of biofilm-forming bacteria to biomaterial surfaces to prevent infection. She has extensive experience in developing and testing composite materials incorporating the degradable biopolymer chitosan as a component, including coatings, films, microbeads, and lyophilized constructs. Her work includes engineering chitosan biomaterials for functionality in tissue regeneration, drug delivery, and infection prevention. She has authored or co-authored over 15 journal articles, one book chapter, 3 patent disclosures, and over 60 presentations and invited lectures. She has served as principle investigator or collaborator on several funded research projects from the Department of Defense, FedEx Institute of Technology, as well as foundation and industrial sponsors. She has mentored more than 10 undergraduate and graduate students in supervised research, several of which have won university research awards and fellowships. She is an active member in several professional organizations, including the Society for Biomaterials, Orthopaedic Research Society, and the Council for Undergraduate Research. She serves as an Early Career Reviewer for the NIH as well as panelist for the National Defense Science and Engineering Fellowship and several other university and industrial proposals. She obtained her BS degree in Biomedical Science at The University of Alabama, and received the Presidential Scholarship as a National Merit Scholar. She completed her MS and PhD in Biomedical Engineering at the University of Alabama at Birmingham, receiving a Graduate Assistance in Areas of National Need (GAANN) fellowship. Her postdoctoral research was conducted in the lab of Warren Haggard, PhD at the University of Memphis from 2007-2010. Currently she is an Assistant Professor at the University of Memphis in the Biomedical Engineering Department of the Herff College of Engineering (2010-present). Dr. Joel D. Bumgardner is currently a professor and Academic Programs co-director in the Biomedical Engineering Department at The University of Memphis (2004-present). His research has provided key insights into material – cell interactions and biocorrosion processes that have advanced our understanding of the health benefit-risks of implant alloys. He also is a leader in investigating and developing the biopolymer, chitosan, for use in implant coatings, drug delivery and tissue engineering applications. He has over 84 journal articles, 17 book chapters, 6 patent disclosures (2 licensed for infection abatement therapies using chitosan materials) and 215+ presentations and invited lectures. More importantly he has mentored over 60 students; 9 of which have received NSF and or Whitaker graduate fellowships, 4 Fulbright Fellowships, and more than 10 students accepted to medical, dental or law school. He has received numerous awards for his research and instruction including the 2012 Outstanding Instructor Award in the Herff College of Engineering University of Memphis, Outstanding Professor (2001 & 2002) Awards in the Bagley College of Engineering, Mississippi State University, and the University of Alabama Engineering School Alumni recognition award as one of the ‘40 Engineers Making a Difference’ 2011. He is also an elected Fellow (2011) of American Institute of Medical & Biological Engineering and a JW Fulbright Scholar (1994), Umeå University, Umeå Sweden. He is active in several professional organizations such as American Association for Dental Research, American Institute of Medical & Biological Engineering and the Society for Biomaterials in which he has held numerous leadership positions including program chair of the 2005 Annual Meeting, and President (2012-2013). He is a regular reviewer for the NIH and NSF and many biomaterials related journals and serves as an Associate Editor of the Journal of Biomaterial Materials Research: Part B. He obtained his BS Degree in Biology from Florida State University, and his BS in Materials Science, and MS and PhD in Biomedical Engineering all from the University of Alabama at Birmingham. Dr. Bumgardner was a faculty member in the Department of Agricultural and Biological Engineering at Mississippi State University (1994-2004).